Just four years after launching, Warby Parker – the world’s well-loved humanitarian eyewear company – announced it has distributed over one million pairs of glasses to people in need through its Buy a Pair, Give a Pair program. When not changing lives in developing countries, Warby Parker sells its designer glasses and shades online to a wide demographic from hipster teenagers to suburban moms. The company has its flagship retail store in Soho, New York City and recently opened its second flagship store in Venice, California, right on the heavily trotted Abbot Kinney Blvd. In total, the company has eight stores nationwide in New York, LA, Boston, Atlanta and Dallas. As co-founder and co-CEO of Warby Parker, Neil Blumenthal drives the socially-conscious businesses, while picking up accolades like Ernst & Young’s Entrepreneur of the Year award and raising a young family in New York City. 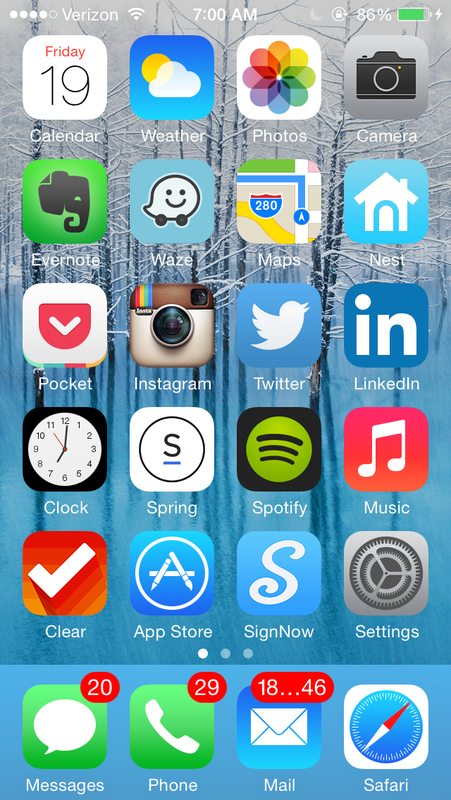 We caught up with Neil recently to see just what’s on his iPhone’s home screen, and the apps he uses to get through his very busy days. 1. What’s the first app you open when you wake up in the morning? My calendar to see the day ahead; then I click on Evernote to read my To-Do List. 2. And when you go to sleep? Pocket— to read some dense articles that will help me fall asleep. 3. What is it about Spring that has everyone all excited? What about the app do you think is truly innovative? The big thing is Spring‘s UX. It’s easy to use, fun, and it simplifies the transactional step of buying on mobile. 4. Facebook didn’t make the home page but LinkedIn did. What does that say about you? That I work too much! Folders introduce an extra step. I’m all about reducing friction. 6. That’s a lot of unread emails, missed texts, and calls….Doesn’t that drive you crazy? 7. If Warby Parker released an app, what would it do? I could tell you but then I’d have to kill you.